Most of you know we had a significant water leak that appeared on a members lot last Sunday afternoon. Of course, as these things usually go, it had to happen on a weekend… and in this case, a holiday weekend too. But despite other commitments, burgers on the grill, or social time with friends, a passionate group of volunteers responded with vigor to repair the leak within about 3 hours. A huge thanks to those who responded. I hesitate to mention names for fear of missing someone, but the team was lead by Bud Covington, Jimmy Smith, and John Fye. Many others also contributed. The incident demonstrated once again the value to our RainedOut Alert system. Those who had subscribed received an advance notice 15 minutes before water was to be shut down… and another 5 minutes later reminding members to make sure their neighbors knew about the problem. It turned out we didn’t have to shut down the entire park as initially thought … the repair team was able to shut down just the street where the leak occurred. We also sent out an “all clear” alert when the job was done. 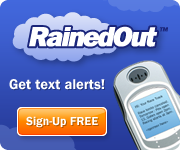 If you haven’t done so, please sign up for RainedOut Alerts. It’s simply the best way to be informed about problems and outages in the park. And do so with your cell phone number for the most timely alerts. I will be in the clubhouse on Tuesday, September 11 between 10am and noon if you’d like assistance with signing up for RainedOut. It should have been updated to show that the whole park will/was shut down but only those lots. numbers on that branch of the line thst was affected. A BIG THANK YOU to everyone that helped us! !